Law can be a cutthroat profession. The performance of music, however, is never cutthroat (ignoring for the moment films like Pitch Perfect). In recognition of Melbourne’s occasionally blinkered attention on sport, music is the ultimate team sport. It is only possible to win with teamwork, but not only that, there is only one team. If there is a winner, you only win together and if you lose, everyone loses. Although law and music might seem dissimilar, each encourages co-operation and community; the legal profession upholds the rule of law for all, and music brings people together to inspire and reinvigorate themselves and others. I started singing at the start of high school (my voice broke early), where I was roped into a newly formed choir; willing male voices being hard to find in suburban state schools. I ended up completing a Bachelor of Music at the University of Melbourne, specialising in composition. In my first year of studying post-graduate law at La Trobe University, I was the Director of the Queen’s College Chapel Choir at the University of Melbourne, a position that allowed me, while in the midst of the intense study of law, some artistic outlet and communal activity. I haven’t had the opportunity to sing consistently since then, so I was thrilled when I was able to become involved in BottledSnail’s new choir for the legal profession, Habeas Chorus. It is great to meet lawyers with an interest in music, performing or the arts. Involvement in something (anything) other than black-letter law is important in a profession that can become all consuming. 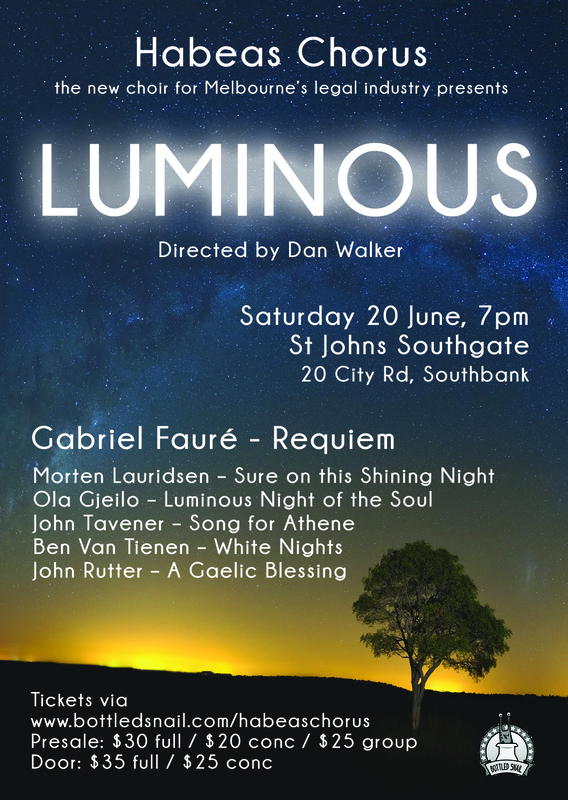 Habeas Chorus’ first concert, Luminous, will be held on Saturday 20 June 2015 at 7pm at St Johns Southgate, Southbank, directed by Dan Walker, and accompanied by Ria Polo and strings from the Melbourne Lawyers’ Orchestra. The performance of music is an inherently communal behaviour (as is the practice of law). It requires a meeting of the minds of the composer, the conductor, performers (both individually and as a single, collective mind) and the audience. When you are one of those participants, it is necessary to imagine yourself in the place of each of the other participants for the whole endeavour to succeed. Not only does music take you to the minds, experiences, expectations and realities of other people, it also takes you to other times or places. Habeas Chorus’ first concert will feature Fauré’s superb Requiem, first written in the late 1880s and subsequently revised to include orchestra. It was performed at Gabriel Fauré’s own funeral in 1924. The work is far less gruesome or gloomy than some other Requiems; it is more tranquil and often angelic. Fauré’s idea of death was “as a happy deliverance, an aspiration towards happiness above, rather than as a painful experience”. “Lux perpetua” shines upon the dead. Light is therefore the theme of Habeas Chorus’ first concert. The concert’s opening work is by Norwegian composer Ola Gjeilo entitled Luminous Night of the Soul, written in 2012 for the Cantare Houston. The text highlights the role of the spirit in communal activities, such as music, poetry and love. Although stepping through various styles, the composer maintains consistency over the whole work through impressive harmonic and melodic control. Ben van Tienen, an Australian composer, used the opaque and evocative words of Paul Auster’s White Nights to create a work with obscure, complex and fascinating harmonies and intense rhythmic interest. This is contrasted with John Tavener’s deceptively difficult Song for Athene (performed at the funeral of Princess Diana), the simplicity, clarity and restrained beauty of which is apprehended sharply with the phrase, “life: a shadow and a dream”. Morten Lauridsen’s well-known setting of Sure on this Shining Night with its modest harmonic palate, but flowing and pleasing melody and phrasing will be sure to delight. John Rutter’s A Gaelic Blessing is full of metaphors for peace, which are amply reinforced by the setting, the lower parts serenely supporting a soaring melody from the sopranos. The extensive and diverse repertoire ensures that this will be a wonderful concert, and the beginning of a promising new musical outlet for legal professionals in Melbourne, for participation either as performers or audience. The legal profession needs new influences and cultural engagement to maintain the confidence of the public. The need for an individual to have a proper balance of work, family and life requires one to try new things and have different experiences, to engage with new people, and expose oneself to new ideas and culture. We hope to see you, your friends and family at the concert, and then at rehearsal next term!